My grandmother is an excellent cook. 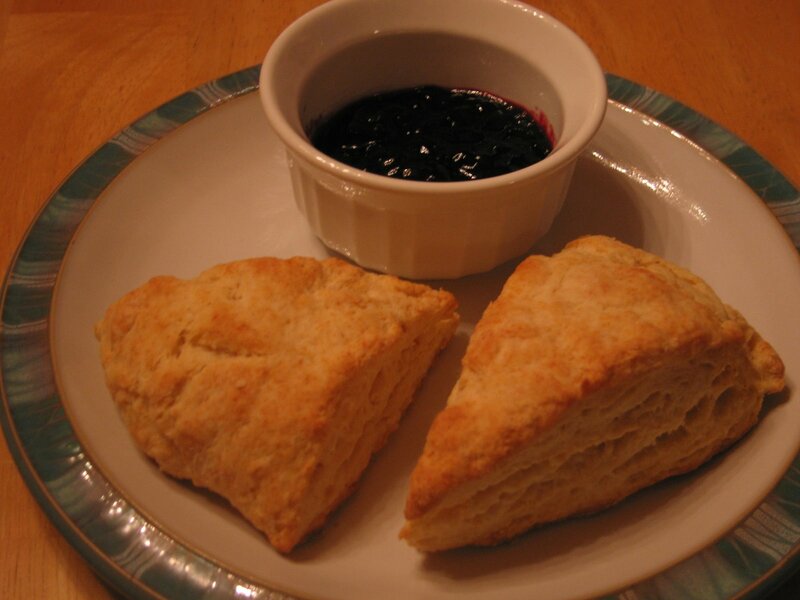 This is one of her favorite scone recipes. While they are called scones, they look and taste more like a buttermilk biscuit. Have them with jam, a little butter, or cut open and put fruit on the scones with a little bit of whipped cream. Preheat oven to 450 degrees. Combine in large bowl the first 5 ingredients. Cut butter into small chunks (with a kinfe) and then add to flour mixture. With your hands, break up the butter into small pea-size chunks. Add enough of the buttermilk to form a soft dough. Put the dough on a floured board and roll out to 1/2″ thickness. With a sharp knife, cut dough in 1 1/2″ rounds, use a 2″ cookie cutter, or cut into 8 small wedges. Place the rounds of dough on an ungreased cookie sheet. Bake for 10-12 minutes, or until golden brown. Serve warm with jam.